During a number of days customers enter a shop and queue for service by a server. 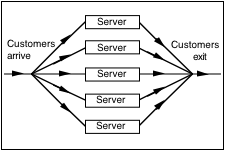 There are several servers, but there is only one queue with a first-in-first-out rule. The customers arrive according to a random Poisson distribution, and the servers have a random negative-exponen­tially distributed service time, i.e. number of customers served in unit time. After closing time no more customers are allowed to enter the shop. The shop closes its door after the final customer has been served and left. The asterisk in *customer,pass launches the customer script as a separate process, much like the postfix ampersand “&” on the Unix command line.